No more punching by hand – the Tamerica Versabind-E Electric Binding Machine does the work for you. This table top machine can handle up to 20 sheets of paper (up to 14″ – legal size) per second and is ideal for medium-sized offices and commercial applications. With an interchangeable Die system, this machine can handle your coil, comb, or wire binding projects. It makes it perfect for a medium sized law office or accounting firm. 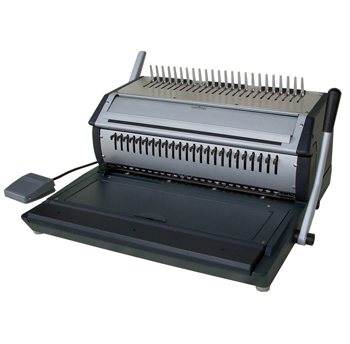 The Tamerica Versabind-E Binding Machine can be used in both electric modes with a foot pedal or manually. The margin depths are adjustable, the dies are disengageable, and you can use it to manually bind books up to 2″ thick. To operate the machine, simply line up the paper you want to punch and bind and activate either the foot pedal or the manual punch handle. Watch your fingers, it’s fast. The Tamerica Versabind-E Electric Binding Machine costs $1899 at Lloyd’s and comes with a 1-year manufacturer’s warranty. You can opt to purchase an extended warranty from Lloyd’s of Indiana for 15% of the purchase price for a 2-year warranty or 20% of the purchase price for 3 years. For more information on the Tamerica Versabind-E Electric Binding Machine or to place an order, please visit Lloyd’s website.